Full time RV living is a great way to get to see the country while still being surrounded by your own belongings. If you have ever thought about getting away from it all and letting the open road lead you to your next adventure, you may be ready to try the RV lifestyle. Before jumping into RV living, make sure to weigh all the pros and cons to ensure it is the best lifestyle for you. If you are not sure, but already have an RV, try living in it while still parked in the driveway to get a taste of what to expect. 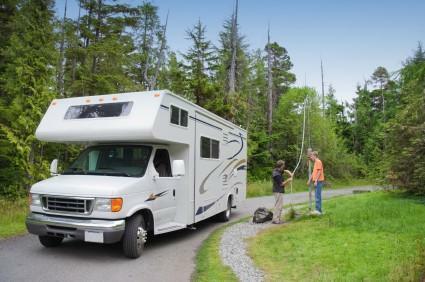 Time is probably the first thing you must think about when deciding whether full time RV living is a good fit for you. If you are retired, you may have plenty of time available to make the lifestyle switch since you are most likely not required to be in a particular location on a daily basis. For those of you that are still employed and plan to continue to work even after converting to RV living, the time situation may be an issue. Though many full time RVers choose that lifestyle so they can travel, you can still live in an RV and work at the same location. Many RV parks allow full time "parking" similar to mobile home parks. Check the ones in your area to be sure as there may be limitations to the number of days per month you can stay at a particular park. This is especially true of federal and state parks which are intended more for vacationers than full time residents. Money is another area that needs to be reviewed before moving into your RV full time. The maintenance and insurance costs for RVs are typically significantly less than traditional homes. Utility hook ups are part of most RV park entrance fees and you won't incur home owner association fees or have to pay someone to mow the grass. The initial cost of the RV, however, may be substantial and should be compared to your mortgage to determine your actual monthly costs.For convenience, you will probably need to invest in a dish for television reception and check the areas where you will travel for wireless Internet connection. These services are necessary if you plan to keep in touch with news and friends. Many RVers are also able to work at least part time by uploading their work to company websites remotely. If this is an option for you, it may ease any cash flow issues that would have prevented you from making the switch from traditional home dweller to full time RVer. Less space is an obvious consideration but you should also determine whether your family is completely on board with sharing the limited RV space. If it is just you and your spouse, there may not be as many issues with permanent close quarters but if children will also be along for the ride, boundaries need to be set. The "she's touching me" whining will be all the more frequent since the children will spend the majority of their time together. Designated areas for each family member helps keep the discord to a minimum.Weeding out unnecessary items is one of the hardest things people have to do when they make the decision to do RV living full time. Since a large percentage of RVers are retirement age, they have a lifetime of belongings to weed through. Though you don't want to merely throw everything out, you do want to make sure the items you are keeping with you have a useful purpose. If you can't bear to part with large, bulky sentimental items, consider storing them in a family member's attic or a storage facility. The less stuff you have crowding the limited space in the RV, the more at peace and less claustrophobic you will be. Now that you have decided full time RV living is in your future, make sure you take the time to downsize properly. Give unwanted or unneeded items to charities such as the Red Cross or local churches or thrift stores. They can resell them to support their work and you can get a beneficial tax break. By giving the items away you also reduce monthly storage fees.